Thu., 25 Jul. - Thu., 1 Aug.
Wed., 17 Jul. - Thu., 1 Aug. Thu., 25 Jul. - Sun., 28 Jul. Thu., 18 Jul. - Thu., 1 Aug. Thu., 6 Feb. - Sun., 9 Feb. Sat., 23 Nov. - Fri., 29 Nov. Sun., 20 Oct. - Thu., 24 Oct. 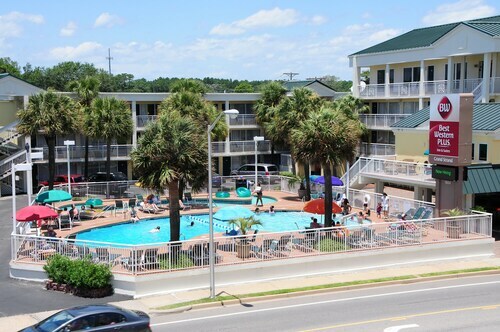 Located in South Myrtle Beach, this motel is within 1 mi (2 km) of Midway Park, Family Kingdom Amusement Park, and Myrtle Beach Boardwalk. SkyWheel Myrtle Beach and The Market Common are also within 3 mi (5 km). 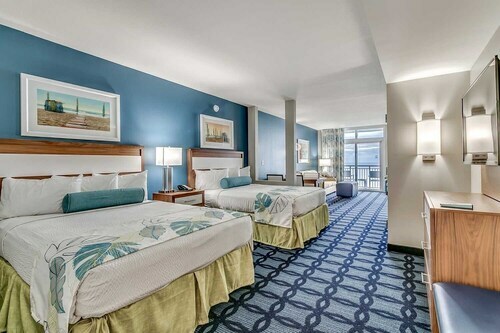 Located in South Myrtle Beach, this aparthotel is 0.6 mi (0.9 km) from Art Museum of Myrtle Beach and within 3 mi (5 km) of Family Kingdom Amusement Park and The Market Common. SkyWheel Myrtle Beach and Myrtle Beach State Park are also within 3 mi (5 km). 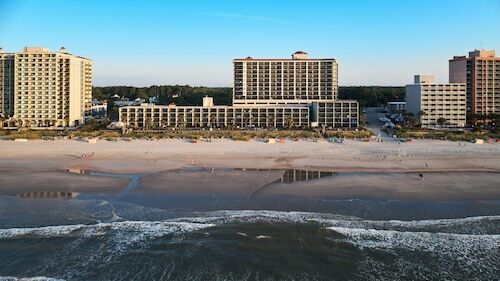 Located in South Myrtle Beach, this hotel is within 2 mi (3 km) of Art Museum of Myrtle Beach, The Market Common, and Myrtle Beach State Park. Family Kingdom Amusement Park and Myrtle Beach Boardwalk are also within 3 mi (5 km). Answer : The cheapest day to fly from Montreal to Myrtle Beach is on Monday. If you want to save a bit of cash on your next business trip look for flights on that day. Question : What is the cheapest airline flying from Montreal to Myrtle Beach? Answer : American Airlines is the leader in keeping costs down for travellers over the next three months. Fares are being booked at just $334 and, when compared to the more expensive bookings of $1,088, it's a great bargain. Question : What is the cheapest date to fly to Myrtle Beach? 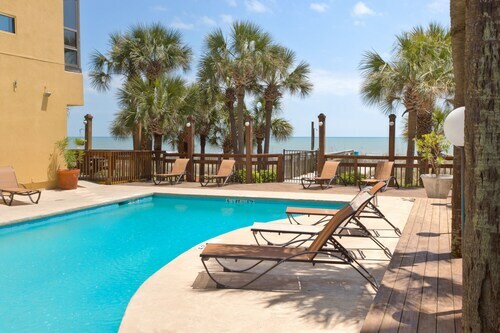 Answer : As of Apr 15th, the best day for deals to Myrtle Beach (MYR) is May 14th. A ticket for this flight will run you around $334, which is 38% less than the average price to book the same route. 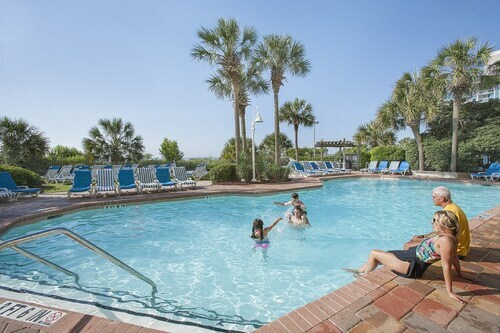 Question : How much is a plane ticket to Myrtle Beach (MYR) from Montreal (YUL)? Prices vary from $334 to $1,088. Booking far in advance can normally help you get the cheapest rate. Don't forget, booking ahead can save you dollars can use to treat yourself to something nice while on your getaway. And who doesn't enjoy treating themselves? Answer : Prices vary from $334 to $1,088. Booking far in advance can normally help you get the cheapest rate. Don't forget, booking ahead can save you dollars can use to treat yourself to something nice while on your getaway. And who doesn't enjoy treating themselves? Question : How long do most people stay on their visit to Myrtle Beach? Answer : Of course, you're not most people, but if you were, you'd stay around 10 days. Answer : You sure can change your departure or arrival date and you may save by changing when you leave. The lowest-cost day to fly in April is Monday. Flexibility is key when booking travel plans in order to keep costs down. Flights from Macdonald Cartier Intl. to Keflavik Intl.